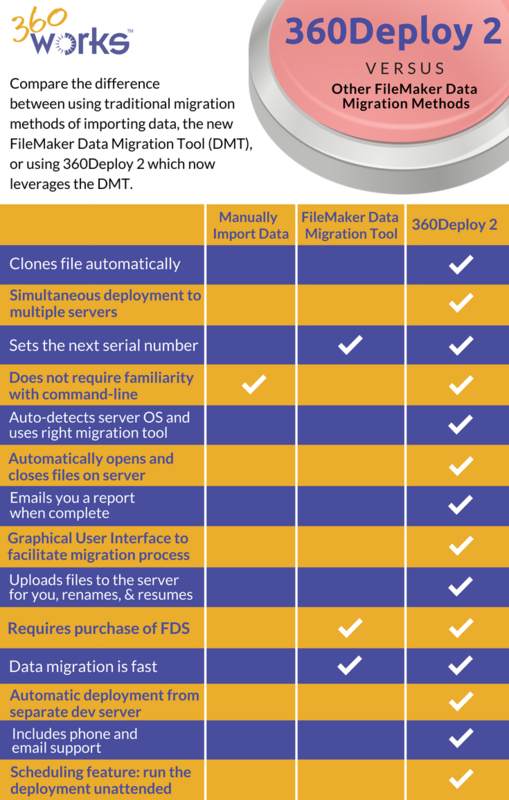 Replay of the 360Works 360Deploy 2 (new major version release) demo on 6/6/2018 presented by Joe Martin at the Atlanta FileMaker Developer meeting. Video recording provided by the Blue Feather Group. 360Deploy 2 is available immediately for purchase from 360deploy.com. Pricing starts at $195, which includes deployment with a single FileMaker solution (this can be a multi-file solution) and a single production server. It allows updated file versions for one solution to be deployed to one live / production server. There is a free demo license available which can deploy to any number of servers for testing and evaluation purposes.